Back in december of 2011, I set up a fansite dedicated to Fallout and Fallout art. 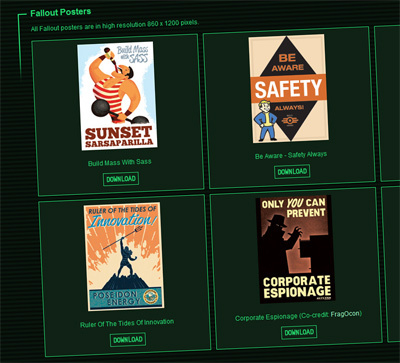 Specifically, it contained several high-resolution Fallout-style posters, clearly inspired by the in-game posters of Fallout 3 and Fallout: New Vegas. I’m a huge Fallout-fan, so I went to all this work primarily to decorate my own apartment. However, after the 10-20 hours I spent making the posters, I thought: Hey, why don’t I share these posters with the other Fallout-fans out there? That being said, I bought the domain name Fallout-posters.com and uploaded the high-resolution Fallout-posters to the page – offering them free to download for the Fallout-community. I also threw in some nice Fallout-vectors. All this was done out of pure “fandom”; I didn’t even include ads on the website. Now, the original post got quite a bit of attention on Reddit, Stumbleupon and similar sites, and during the first few days, I got more than 100.000 unique visitors to the site. My host actually mailed me personally and forced me to move the site to a bigger server (which I paid had to pay extra for). So far, so good. 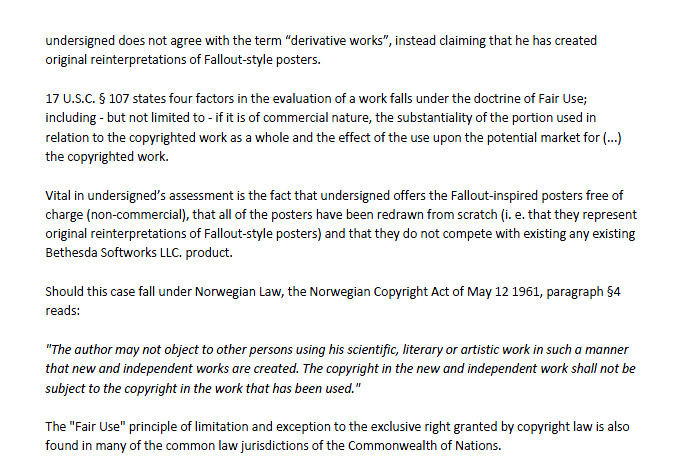 I made some free posters, set up a quick one-page site and leaned back to enjoy the fact that I was helping Fallout-fans around the globe. But suddenly, after a few weeks, I got an email: What’s this in my inbox? 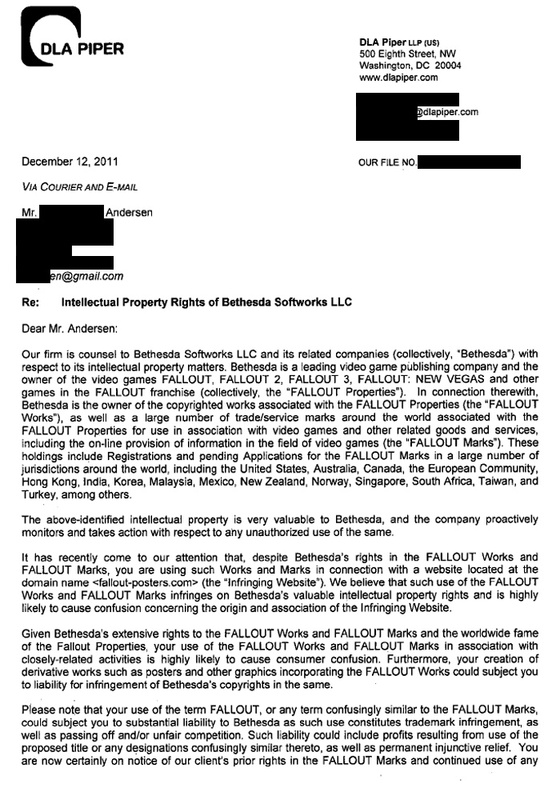 A legal letter from the global law firm DLA Piper on behalf of Bethesda? Now, I’m not out looking for trouble. 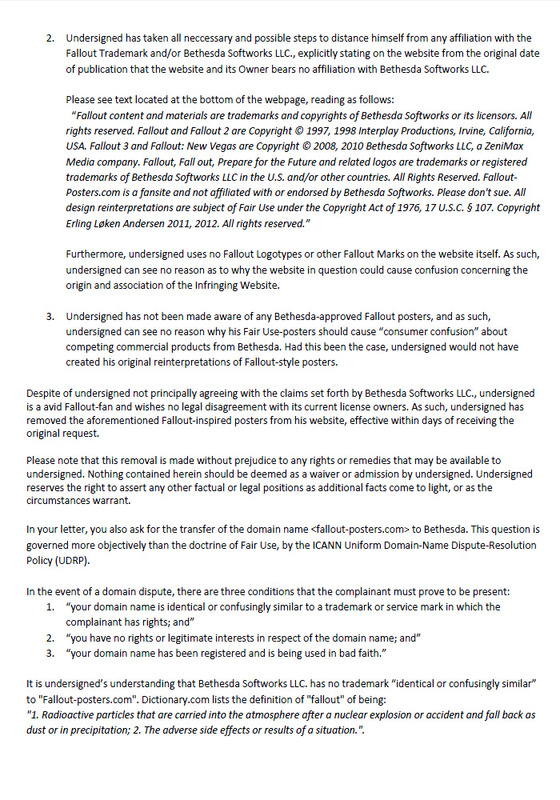 I set up the website out of pure “fandom”, and the last thing I wanted – or expected – was to be threatened with a lawsuit by Bethesda. 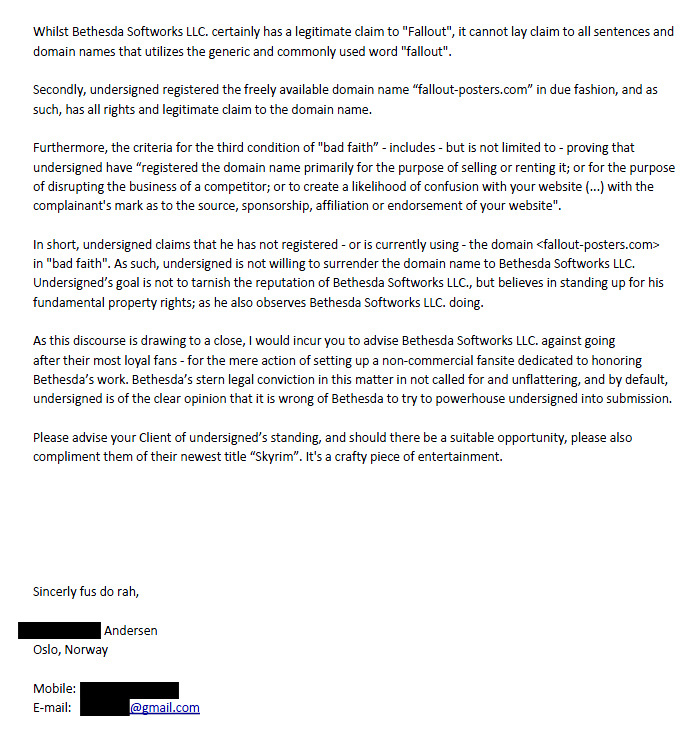 What pisses me off isn’t the fact that they’re looking out for their trademark – as they have every right to do so. What I’m pissed about are large companies abusing their monetary power, hiring global law firms to go after a fan online, immediately threating with a lawsuit. Had they had the slighest bit of PR-savyness, they would have shot me a quick personal mail asking me to remove the (supposed) infringing content – and preferrably sent me some nice Fallout-swag as a nice gesture (yes, I am that corrupt). But no, they had to bring DLA Piper into the picture. You know what? I’m tired of behaviour like that. 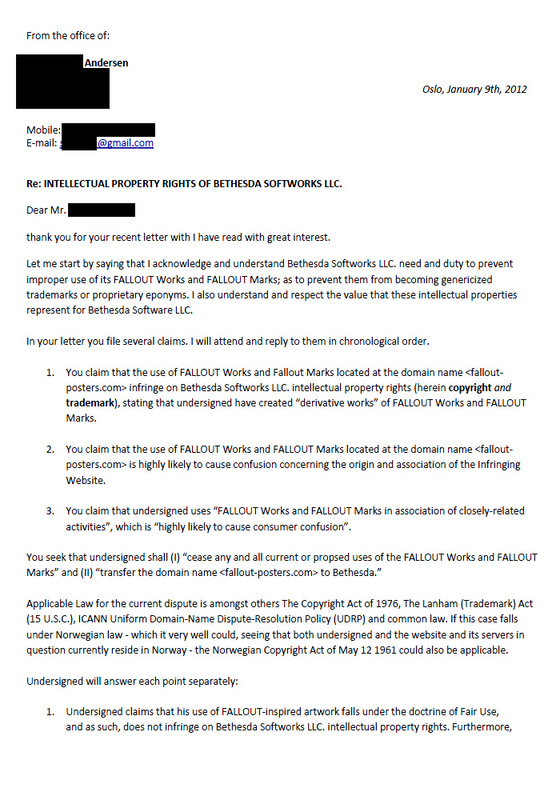 I’m tired of intellectual rights holders – be it RIAA, MPAA or in this case Bethesda – going after little guys like myself and threatening them into obedience. Some people doesn’t have the intellectual capacity or money to fight their cause, so they just fold after receiving a letter like that. But just because you can’t afford to fight, doesn’t mean your oponent is right. So I decided to respond. 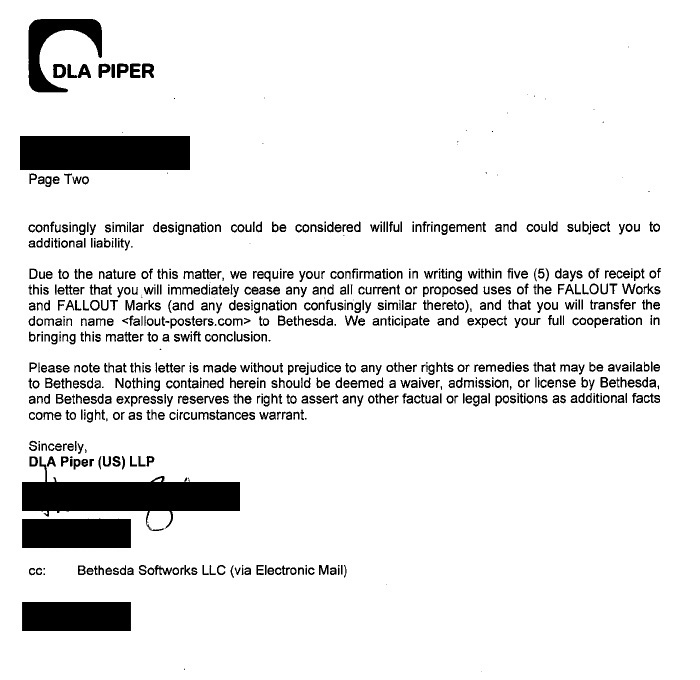 So far, I haven’t heard back from DLA Piper and Bethesda – but if I do, I’ll be sure to let you know. In the mean time: Here’s to the little guys! 497 respondenter deltok i undersøkelsen om mobile medier som kjørte på det norske nettsamfunnet Biip.no i november måned. Biip.no sine besøkende er i all hovedsak mellom 12-20 år, med en svak overvekt av jenter. Av de 497 som deltok i undersøkelsen opplyser nærmere 34% at de eier en Sony Ericsson-telefon. Apple iPhone kommer på en klar andreplass i undersøkelsen med 18,5%, etterfulgt av HTC (18,5%), Nokia (15,9%) og Samsung (9,5%). Færre enn 3% av de spurte ungdommene opplyste å ha Motorla, LG eller Blackberry-telefoner. operativsystem på mobiltelefonen sin, mot Apple iOS sine 17%. Deltakerne i undersøkelsen på Biip.no er også hyppig brukere av mobilt internett: 55% opplyser å bruke mobilt internett ukentlig eller oftere, mens bare 28% av de spurte oppgir å aldri bruke mobilt internett. De mest populære mobile nettsidene sortert etter popularitet er ikke uventet Facebook og VG.no, etterfulgt av «andre nettsider». 50% av de spurte i undersøkelsen som kjørte på Biip.no oppgir å ha lastet ned applikasjoner til mobiltelefonen sin. Av disse foretrekker hele 78% applikasjoner fremfor mobile nettsider. Det kan dermed syntes som om mobile nettsider har en vei å gå før de kan konkurrere om ungdommens gunst. Av undersøkelsen kan man også lese at det er tydelig at mobile applikasjoner begynner å få fotfeste: Av de som har lastet ned applikasjoner til telefonen sin, laster den typiske brukeren ned 5 applikasjoner i måneden – men hele 15% opplyser å laste ned «10 eller flere» i måneden. 497 respondenter deltok i undersøkelsen, som ble kjørt på Biip.no i samarbeid med amerikanske SurveyMonkey i november 2010. Se hele undersøkelsen her. Biip.no AS driver nettstedene Biip.no og Spill.no. Biip.no er et av Norges største nettsamfunn. Selskapet er eid av TV 2 AS og Egmont Serieforlaget AS, har 14 ansatte og omsatte for 12 mill. NOK i 2009. Selskapet har hovedkontor i Oslo. Det norske nettsamfunnet Biip.no åpner databasen sin med 450.000 registrerte medlemmer for studenter og forskere. Studenter og forskerne vil ha gratis til databasen, som blant annet kan brukes til å gjennomføre spørreundersøkelser, gjøre sosiologiske undersøkelser eller såkalte «crowdsourcing»-aktiviter. Det norske nettsamfunnet følger dermed i sporene til giganter som for eksempel Facebook. Facebook lanserte sin åpne plattform i mai 2007. Siden dette har det blitt utviklet mer enn en halv million applikasjoner som benytter seg av mulighetene som den amerikanske plattformen tilbyr. – Vi sitter på en enorm database over mennesker, hvordan de interagerer på nettet, hva de tenker, sier og blogger. Vi vet hvor mange bilder en gjennomsnittlig jente på 15 år legger ut på nettet – og hvor mange kommentarer hun sannsynligvis kommer til å få. Vi vet hvor hun bor, hvor ofte hun bytter mobilnummer og hvem hun er kjæreste med akkurat nå. Vi vet også veldig mye annet om våre 449.999 øvrige medlemmer. – Vi kommer selvfølgelig aldri til å dele våre medlemmers private informasjon, men ønsker å komme i kontakt med studenter og akademiske miljøer som kan hjelpe oss utnytte det enorme potensialet som ligger i all metainformasjonen vi har om våre brukere. Biip.no presiserer at data-frislippet kun gjelder studenter og forskere innenfor relevante fagområder, og foreløpig ikke omfatter kommersielle aktører. For mer informasjon om frislippet, besøk Biip.no sin offiselle blogg. Biip.no AS driver nettstedene Biip.no og Spill.no. Selskapet er eid av TV 2 AS og Egmont Serieforlaget AS, har 14 ansatte og omsatte for 12 mill. NOK i 2009. Selskapet har hovedkontor i Oslo. Digg.com is now smaller than Reddit.com in Pageviews, shows numbers from Alexa.com, the web information company. Although Alexas numbers aren’t an exact science, its graphs and numbers are often quoted in mainstream media, giving an approximation to the real life facts. The userbase of social bookmarking website Digg.com has been in uproar ever since the new Digg v4, in which popular functions such as Upcoming News, the entire Video-section and other key functionality was removed. Observing Daily Reach (in Percent), Digg’s decline isn’t as clear. Digg.com shows a small decrease in traffic, whilst Reddit.com makes a small jump – before falling back down. These numbers can be misleading though, as a lot of people may visit the new Digg.com to merely observe the changes – before making a hasty retreat. Observing Daily Pageviews, Digg’s decline is much clearer: Digg.com makes a sharp, downward plunge in Pageviews (a drastic 32,6% decrease in 1 month), whilst Reddit.com makes a solid jump – positioning it just above the former champ. Pageviews may give a good representation of the actual situation, as a decline in Pageviews shows a decrease in the overall user activity on the website. This makes Reddit.com the world’s largest social bookmarking website per September of 2010, according to Alexa.com. This isn’t supposed to be a blog about programming, but I’m working a lot with PHP and Smarty these days, and whenever I manage to crack a problem, I get this strange feeling of acchievement. Then I come here to brag. Let’s for example say you have a bunch of Meta Keywords that are bundled together in the database (games,game,online,playing) – and you want to separate them, so that you can create keyword-specific landingpages for on-site search optimalization (games – game – online – playing). See what we did above? First we begin by telling the system that we want to create a new variable called $keywords. Then we continue by telling that the value we want to split is “,” and finally we tell it what string to use (in this case, $MetaKeywords). This results in the string stored in $MetaKeywords being split into different arrays named $keyword, $keyword, $keyword and so on. Hope this blog post helps some poor soul one day… Keep hacking. 3. Televised contents gave cash prizes to whoever could store the most data in their head. 4. Well, the screens were bigger, but they only showed movies at certain times of day. 9. Is that the new iPhone 27G? Does it have multitasking yet? 10. I just can’t get used to this darn vat-grown steak. Texture ain’t right. 11. Radio? It was a one-man version of Spotify. 12. We used to chop down trees and write yesterday’s news on them. Luckily, that was banned just before you were born. 13. I for one welcomed our new alien overlords. 14. Your grandma and me met a bar. It was a kind of “Second Life beta”, but with actual liquid drinks and smelly people. 15. Back in my day, “Skynet” was still known as “Google”. First 10 entries courtesy of Wired magazine, Oct. 2009.